It has been 10 months since Morgan Williams cowered under her teacher's desk as bullets were fired into her Florida classroom; 10 months since 17 people died in the halls and rooms of Marjory Stoneman Douglas High School; 10 months since Morgan and her classmates found themselves at the centre of the battle for stronger gun control. "It's frustrating because I know I'm not the same person I once was and I wish I didn't have this ongoing battle inside between the new me and the old me," the aspiring screenwriter told the BBC just before Christmas. "This is my senior year of high school and I absolutely hate it. It's the worst year of my life and I cannot wait until I finally graduate and move out of this area. "It's impossible trying to heal and move forward with my life when I have to see the building everyday." As senior Emma Gonzalez said, "thoughts and prayers" - the stock response of so many US politicians - were no longer enough. "When people think about Parkland, they do not immediately picture crying mothers and the face of the mass shooter," Cameron Kasky, who co-founded the March for Our Lives movement along with Emma and other students in the days that followed the shooting, told the BBC in December. "They think of people, children in particular, rising up and daring our country to do better." And - initially at least - it seemed the politicians had heard their cries. The Florida legislature set about bringing in tougher rules: less than a month after the Parkland shooting, laws were brought in that included raising the legal age to buy guns from 18 to 21, banning bump stocks - a device enabling semi-automatic rifles to fire hundreds of rounds a minute - and introducing a three-day waiting period on all gun purchases. Donald Trump even promised to take on the powerful National Rifle Association (NRA) - which reportedly donated more than $30m (£24m) to help his 2016 campaign - telling lawmakers gathered at the White House: "I want you to come up with a strong bill - and really strong on background check." What's more, while the numbers subscribing to the NRA's magazine may have dipped in the immediate aftermath of the shooting, it was soon climbing again. According to official documents, the figure rose from 580,000 to 650,000 between February and June. And it didn't take long for Mr Trump to return to the NRA, as he took to the stage at its annual convention less than three months later. "Your Second Amendment rights are under siege. But they will never, ever be under siege as long as I'm your president," he told those gathered in Dallas. 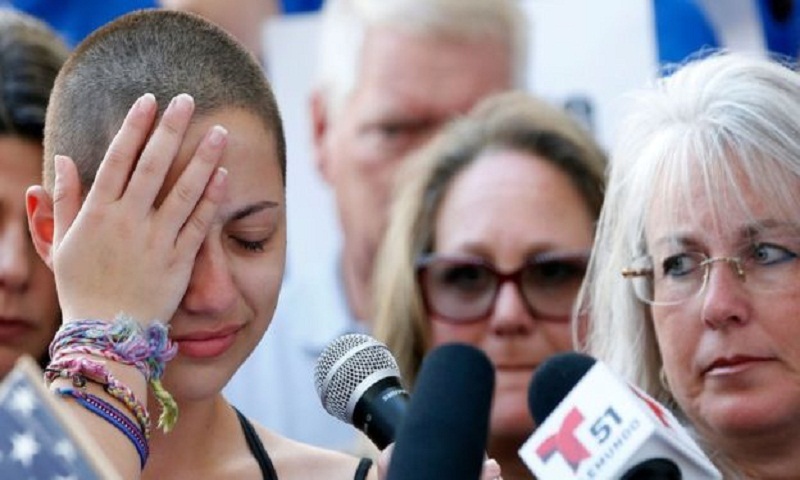 It rejected calls for things the students had demanded, like raising the minimum age at which you could buy guns, while suggesting - controversially - arming teachers. It wasn't what the students had hoped for. There was one clear victory, however. The Trump administration banned the use of bump stocks. The final date to destroy or turn in the devices is 21 March next year - just shy of 12 months on from the March for Our Lives. Just last Saturday, David Hogg - one of the strongest voices to emerge from the student body - revealed he would be attending Harvard next year. Then there is the picture shared by Max Schachter - father of Alex, one of seven 14-year-olds killed that day - of a group of friends enjoying a meal. It is only on closer inspection you realise these are people who most likely would not be together were it not for 14 February. These are friends united in grief: parents who lost children at Marjory Stoneman Douglas, the "MSD 17 club", as Max put it. The cameras, of course, still turn up every time there is a new development - something, Morgan says, "many of the students hate". "It's hard enough going back to that school everyday and people asking questions doesn't make it any better," she explains. She had hoped the new school year would be easier; she certainly "didn't think it would be as hard as it has been". The fire alarms going off in the school "sometimes twice in one day" hasn't helped either, she says: "Kids were having panic attacks and crying because of the memories the sound brought back." "I believe that all the activism has made a change, it's just really hard for me to see it sometimes when I constantly get news of yet another shooting," Morgan says. "I don't know everything about the government and policies, but it doesn't seem hard to understand the fact that people are dying at the expense of a gun."